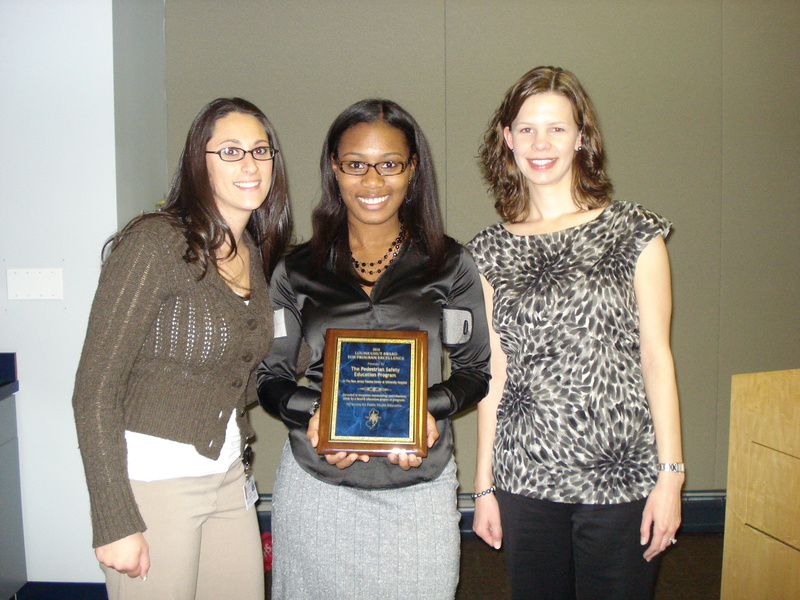 Iesha Suber, Essex County Safe Kids Coordinator and Injury Prevention and Outreach Coordinator at the New Jersey Trauma Center was recently presented with the 2010 Health Educator of the Year Award by the New Jersey Society for Public Health Education (NJSOPHE). This award recognizes a dedicated member of NJSOPHE who has shown an active commitment to Health Education and the organization through demonstrated involvement in NJSOPHE and excellence in the practice of Health Education. Congratulations Iesha on this well deserved honor! Pictured above from left to right: Dawn Snyder, Pedestrian Safety Health Educator; Iesha Suber, Chair, NJSOPHE Program Committee and Safe Kids Essex County Coordinator and Robin Vlamis, Chair, NJSOPHE Awards & Scholarship Committee.